If we allow the sense of boredom and tedium to fester within us, we construct a wall between the Holy services and our souls. Despite the initially trivial sound of such plaintive moaning, there are serious issues underlying these questions. If we allow the sense of boredom and tedium to fester within us, we construct a wall between the Holy services and our souls. Grace is imparted to us through the Sacraments of the Church, and if we erect barriers we hinder our ability to immerse ourselves fully in the Sacraments. At best, we limit our spiritual growth. At worst, we drift further away until we quit coming to services altogether, and end up having cut ourselves off from the Church. What we need to do, rather than to try to pretend to ourselves or our children that Church services are not boring, is to do the opposite: we need to accept that they are boring-when perceived from a view point of the modern age’s “culture.” We now come to services with our hearts and minds so attuned to the modern concepts of “fun” and “entertainment” that we do find ourselves bored. The heart of the matter is that the technological changes of the modern age have produced such a grotesquely sensual world that the dignity of Orthodox services has been buried under a deluge of garbage in our perceptions. For most of human existence, daily life was simply a struggle to survive. Homes were simple, with minimal decorations, and virtually no furniture. Possessions were largely limited to essentials, and Art was an issue only for the wealthy. Music has always been a part of social life, but only formally used for celebrating (or mourning) a very special day. The ability to read and write was a rarity, and books or manuscripts were considered as treasures. Because of the holiness of the Church, and wanting to impart the sense of the church temple as being a foretaste of Heaven, the buildings were constructed whenever possible on a grandiose scale. They were filled with rich imagery of the life of Christ, and of multitudes of Saints. Rich, harmo-nious music filled the temples. The odor of sweet incense wafted up, and all of the senses had the opportunity to participate in the worship of God. Many accounts exist throughout the centuries of the onlookers’ sense of being overwhelmed by the beauty of it all. The services offered meaning and color to otherwise mundane and simple lives. Gradually, technology has overdosed our senses. Now even a poor apartment has more amenities than did the richest of castles. Virtually all of us own more possessions than could ever be imagined. Even poor families now are able to lounge in soft recliners and sofas, and to revel in luxury. Technology has given us more “free time: and the opportunity to seek out excitement in our lives. Theme parks and amusement rides have become a standard part of Americana, and allow us to experience any kind of thrill we want. Through the inventions of radio and the recording technologies, we have access to music day and night. Many people have now become addicted to having endless music around them, and think they cannot function without it. Most importantly, however, is the all-pervasive output of imagery. We are bombarded with pictures every waking second of our life-magazines, newspapers, photographs, billboards, and every other flat surface has an image. And now, during this last century, we have perfected moving images. Movies and TV produce a never ending glut of action and adventure, sexuality and horror. Each new production strives to outdo its predecessors in captivating the attention of the populace. Entertainment has now become our reason for existence it would seem. Everything is judged on the basis of how fun it is. We are now even toying with “virtual reality” as a new, all encompassing imagery designed to more fully intoxicate our senses. Where does this leave us with Church services? Our services are still as full of beauty and of truth as ever, but our senses are too glutted to notice. Our expectations of being entertained leave us feeling unfulfilled at church. Fewer and fewer people come. Our hearts may still cry out for God, but everything in our culture subconsciously tells us that the Church is outdated and no longer relevant. Some Christian groups (including, unfortunately, some Orthodox churches) have tried to combat this phenomenon head-on-and with bizarre results. The Roman Catholics, with their Vatican II Council decided to try and modernize and simply make everything easier. Services were shortened, obligations were eliminated, and everything was changed. The result has been a near total collapse of discipline within their church and a massive exodus. Some protestant groups, on the other hand, have tried to compete directly and have designed their churches like theaters, and put on professional concerts and multi-media services in an attempt to draw and hold followers. Their result has been to supplant what-ever vestiges of worship were left with just more entertainment. What then, are we to do? The following four steps may serve as a partial antidote to the poison our modern age has injected into our souls. 1. Realize that the issue is not something the Church is able to solve by changing itself. The Church’s calling is to testify to the Truth and to save souls, not to entertain. Understand that the Church services are ordained by God for assisting us in our spiritual growth and salvation. Realize that the problem is not within the services themselves, but with our perception of them. 2. Accept that, from a worldly point of view, the services are “boring.” Trying to pretend that they are something which they are not will only lead to frustration, disappointment, and alienation from the services. Accept that you are not going to be entertained. 3. Begin by simply re-focusing your mind on the services first as an obligation to God. Set aside the times for services as your sacrifice to God, a time in which you expect nothing in return. It is im-portant to not only offer the time physically, but also to dedicate the time mentally to God, by thinking only of Him and His Holy Church. It must be emphasized that services are never truly “boring,” because it is during that time that we are making contact with the supernatural world, and joining ourselves to God Himself through our prayers. If we could see the spiritual world we would never want the services to stop. But, unfortunately, as we are all products of our 20th century world, we use modern, worldly criteria for judging the quality of the services. If we can only look on the Divine Services as our necessary path to salvation, and not as potential entertainment, we can begin to free ourselves from the subtle demonic suggestion to judge services by how fun they are. It is when we have experienced something repeatedly that boredom most often sets in, souring our appreciation and dulling our senses. Those of us so afflicted with respect to the church services, or who take them for granted, would do well to borrow a fresh pair of eyes. “We did not know whether we were in heaven or on earth,” exclaimed the envoys of Prince Vladimir, when they reported to him their experience in attending the Divine Liturgy in Constantinople’s Hagia Sophia. 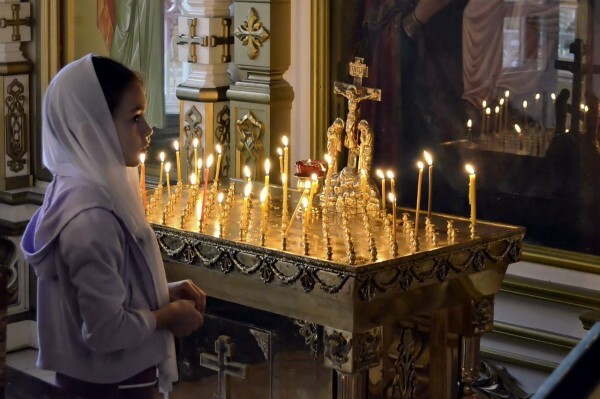 Even Orthodox services held in more humble temples, houses churches and small chapels, can be deeply moving. A recent visitor to a small parish in the Mid-West was inspired by his first Divine Liturgy to pen the following poem. and becoming a pile of ashes. with the lions singing like angels. It was like breathing fire. and he let me win. It was like a wedding.